Ground Effects operates over 15 facilities that have the ability to apply OEM-level decorative and functional films for various applications. 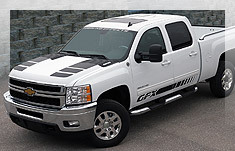 Everything from hood and body wraps to custom graphics. Our films and wraps are custom designed in-house and expertly applied by trained technicians to create distinctive packages for Ram, Dodge, GM and Ford.